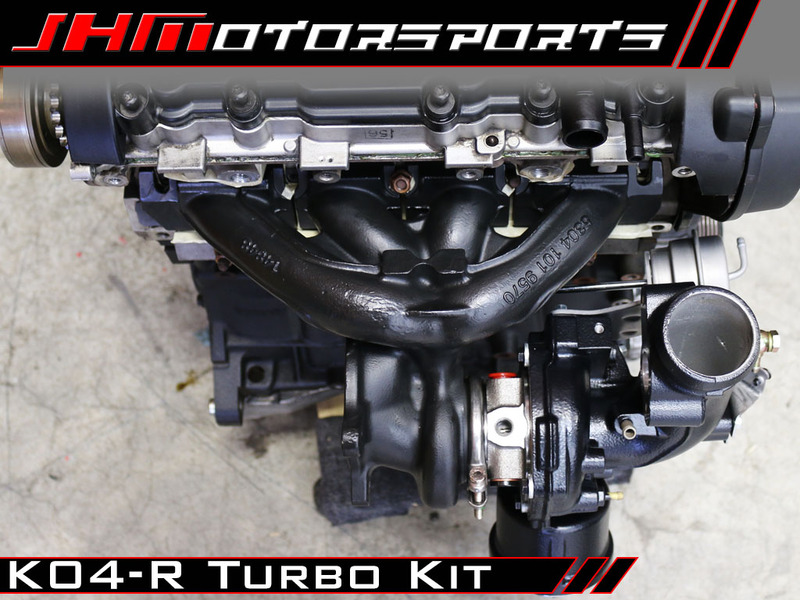 Introducing the JHM B7-A4 2.0T K04-R Turbo Kit with Tuning and Fueling!!! The JHM B7-A4 2.0T K04-R Turbo Kit is the ultimate OEM+ style performance solution on the market for the B7-A4 2.0T. With common bolt-ons and supporting hardware we are able to turn the B7-A4 into a monstrous street machine! We have been working extensively on developing the B7-A4 2.0T platform and creating products that deliver proven real world performance. One of those products that really stands us apart from the competition is our performance ECU calibrations. Our stock turbo (K03) tuning completely revolutionized the B7-A4 2.0T. We brought our extensive experience and the latest advancements in ECU calibration for the Audi FSI Engine. By changing hundreds of calibration parameters we have delivered a dynamic driving experience bringing more power in areas previously considered not possible. 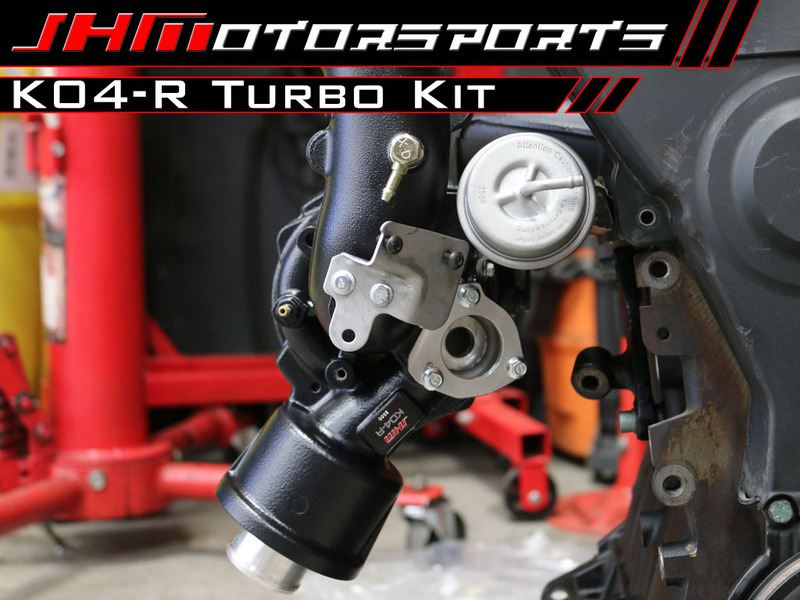 With our JHM B7-A4 K04-R Turbo Kit, we have once again pushed the envelope a step further! In addition to being the most cost effective turbo solution on the market, this Stage 3 package has been optimized to be used on a 2.0T FSI engine with STOCK internals. That means that you do not have to spend money on extensive engine builds to be able to reap the power benefits that our turbo kit has to offer! - 100% BOLT-ON Solution - The Compressor and Exhaust Housings have been designed to fit like the OEM K03 (Stock Turbo) requiring no modifications for installation. - High-flow, lightweight, C355 aluminum, dual-stacked compressor wheel that features a more efficient flow rate over the OEM K04 compressor wheel. - Re-profiled or "bored out", aluminum compressor housing with tighter wheel clearance. - Re-designed and upgraded 360 degree thrust kit, piston rings, and high-flow journal bearings. - The K04 turbine housing ("hot side") has been re-profiled or "bored out" with tighter clearances to suit the high-flow, 713C Inconel K04-R turbine. - Rotor shaft and compressor wheel are dynamically balanced then the Center Housing Rotating Assembly (CHRA) is fully re-assembled allowing us to fine tune them with a VSR balance to tolerances below the specified tolerances of BorgWarner. - Upgraded, high-strength, lightweight rotor shaft & compressor wheel. - Clipped turbine wheel to increase the mid-range and top-end power of the car. This also greatly reduces the back-pressure upstream of the turbocharger increasing the exhaust flow through the turbine. - Each turbocharger is designed and manufactured to JHM standards by our supplier. Another advancement that we have brought to the B7-A4 2.0T platform is our proprietary JHM Launch Assist. Developed for the B7-RS4 as an industry first, we have implemented our JHM Launch Assist on all 6-Speed Manual tunes for the B7-A4 2.0T. When activated and engaged, the JHM Launch Assist reliably gets your car from zero to all out acceleration every time! Our JHM ECU Tuning for the B7-A4 2.0T also features Program Switching, allowing you to switch between tunes through the cruise control stalk. No external devices required! 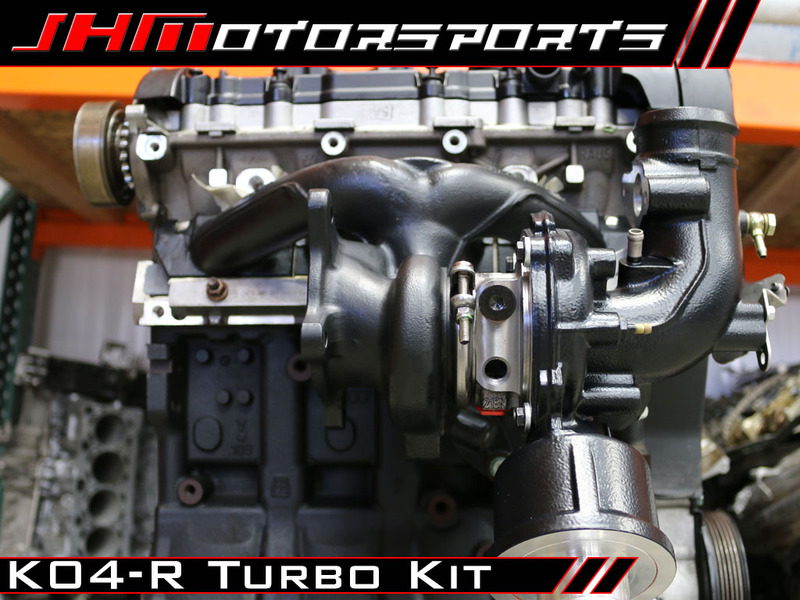 In order for the JHM K04-R Turbo Kit to operate under the specifications called for by our performance software, a Turbo Back Exhaust (TBE) system is REQUIRED. A TBE consists of an aftermarket Testpipe (TP) or High Flow Cat Pipe (HFC), Downpipe (DP), and Catback (CB). Optimal TP/HFC or DP sizing is 3 inches in diameter. Optimal CB sizing is dual 2.5 inches or larger. If your current TBE does not meet or minimum requirements, please go back one section to add our TBE components to your shopping cart. 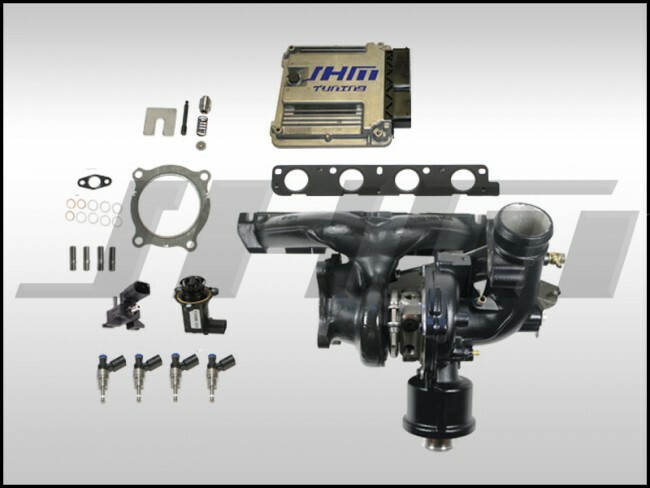 Our JHM K04-R Turbo kit fits ALL 2005.5-2009 - B7-A4 2.0T FSI Avant, Cabriolet, and Sedan in both Automatic or Manual and FWD or quattro. This turbo kit was built around utilizing proven upgrades. There is a chance you may already own some of the parts that are included our this kit. If you do you can have them removed from the kit using the dropdowns below and we will credit you towards the overall cost. - S3 Injectors: S3 Injectors are included in this turbo kit. If you already own S3 Injectors we can have them removed from the kit and credit you towards the overall cost in the dropdown below. - JHM Tuned: If you are currently tuned with JHM performance ECU calibrations you will receive a tuning credit towards the overall costs. Please select the corresponding option from the dropdown below. - Upgraded High Pressure Fuel Pump: An upgraded high pressure fuel pump is required for this kit. If you already have one, we will credit you towards the overall cost. Please select the corresponding option from the dropdown below. - Transmission Type: In order to confirm that we have an ECU calibration for your specific box code, please select your transmission type from the dropdown below. - Year: In order to confirm that we have an ECU calibration for your specific box code, please select the year of your B7 (2005.5 to 2009) from the dropdown below. - Country: In order to confirm that we have an ECU calibration for your specific box code, please select your B7's region (USA - Canada or Rest of World) from the dropdown below. - Flashing Method: With the new JHM Flashing Server we have the ability to flash our JHM Stage 3 Big Turbo Kit ECU Calibration to your car without removing the ECU. You can either have this done at your local JHM Flashing dealer (call us for a location near you) OR you can purchase a cable and perform the flash yourself. Select your preference using the dropdown below. NOTE: As of right now the software included is a safe base file until we officially launch our K04-R Software. If you have the ability to provide quality logs from VCDS we can work on getting you software sooner.